AVR ATMega8 microcontroller has inbuilt SPI module. 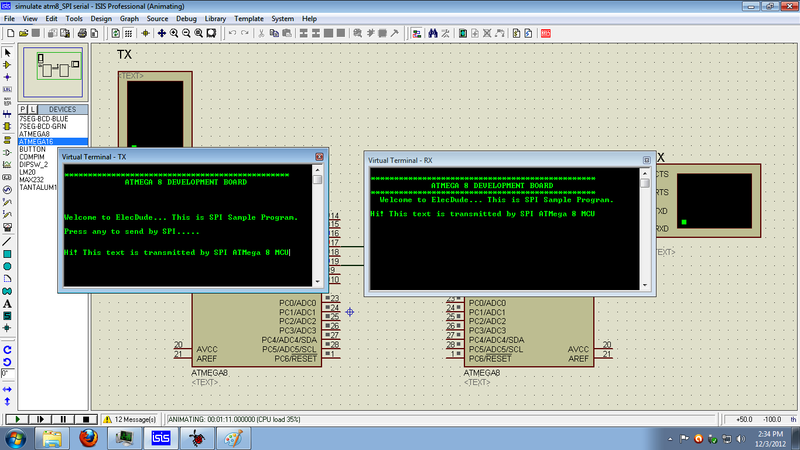 First SPI intorduction, and then let us see how to use it. · SS: slave select (active low, output from master). To begin a communication, the bus master first configures the clock, using a frequency less than or equal to the maximum frequency the slave device supports. Such frequencies are commonly in the range of 1–100 MHz. The master then transmits the appropriate chip select bit for the desired chip to a logic 0. A logic 0 is transmitted because the chip select line is active low, meaning its off state is a logic 1; on is asserted with a logic 0. If a waiting period is required (such as for analog-to-digital conversion), then the master must wait for at least that period of time before starting to issue clock cycles. Not all transmissions require all four of these operations to be meaningful but they do happen. 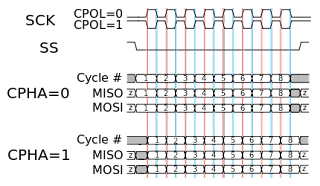 Transmissions normally involve two shift registers of some given word size, such as eight bits, one in the master and one in the slave; they are connected in a ring. Data is usually shifted out with the most significant bit first, while shifting a new least significant bit into the same register. After that register has been shifted out, the master and slave have exchanged register values. Then each device takes that value and does something with it, such as writing it to memory. If there is more data to exchange, the shift registers are loaded with new data and the process repeats. Transmissions may involve any number of clock cycles. When there is no more data to be transmitted, the master stops toggling its clock. Normally, it then deselects the slave. Transmissions often consist of 8-bit words. Every slave on the bus that hasn't been activated using its chip select line must disregard the input clock and MOSI signals, and must not drive MISO. The master must select only one slave at a time. In addition to setting the clock frequency, the master must also configure the clock polarity and phase with respect to the data. Freescale's SPI Block Guide names these two options as CPOL and CPHA respectively, and most vendors have adopted that convention. The timing diagram is shown to the right. The timing is further described below and applies to both the master and the slave device. Ø For CPHA=0, data is captured on the clock's rising edge (low→high transition) and data is propagated on a falling edge (high→low clock transition). Ø For CPHA=1, data is captured on the clock's falling edge and data is propagated on a rising edge. Ø For CPHA=0, data is captured on clock's falling edge and data is propagated on a rising edge. Ø For CPHA=1, data is captured on clock's rising edge and data is propagated on a falling edge. That is, CPHA=0 means sample on the leading (first) clock edge, while CPHA=1 means sample on the trailing (second) clock edge, regardless of whether that clock edge is rising or falling. Note that with CPHA=0, the data must be stable for a half cycle before the first clock cycle. For all CPOL and CPHA modes, the initial clock value must be stable before the chip select line goes active. The MOSI and MISO signals are usually stable (at their reception points) for the half cycle until the next clock transition. SPI master and slave devices may well sample data at different points in that half cycle. This adds more flexibility to the communication channel between the master and slave. 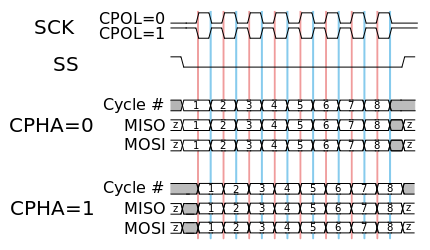 Independent slave configuration, there is an independent chip select line for each slave. This is the way SPI is normally used. Since the MISO pins of the slaves are connected together, they are required to be tri-state pins. WCOL - Write collision flag. 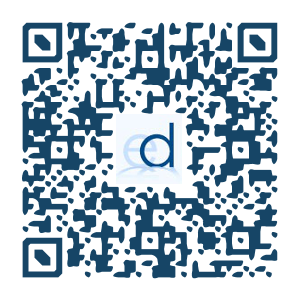 Set when SPDR is accessed while data transmission is in progress. NOTE: Fosc is the MCU Oscillator frequency. 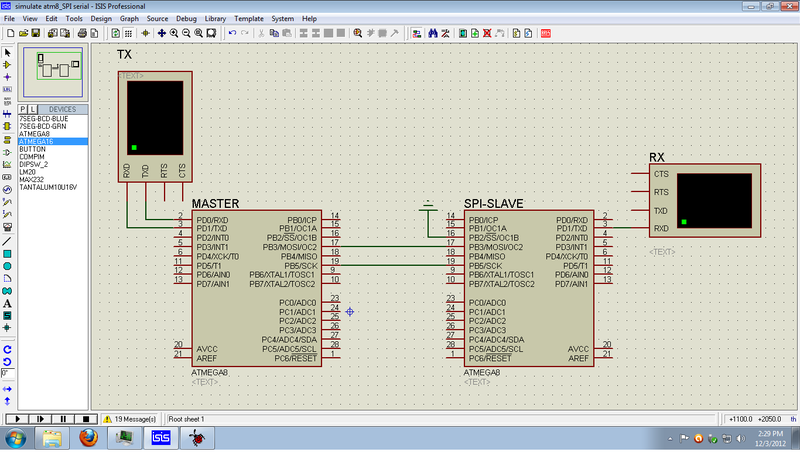 In this example, the character is received by MASTER through UART & transmitted to slave by SPI. The SLAVE is configured to generate an interrupt on reception of a SPI byte. The interrupt handler sends the received character on UART. The UART functions are as in the previous tutorial. Click to see UART example. 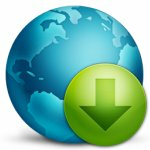 Click to download the SPI MASTER and SLAVE C file. It is complied by AVRStudio (4) & simulated using Protues software.